Which paintings are in the drying room? As the Norwich Playhouse exhibition deadline approaches, I am doing the final touches to frames, labels and new paintings in the drying room. 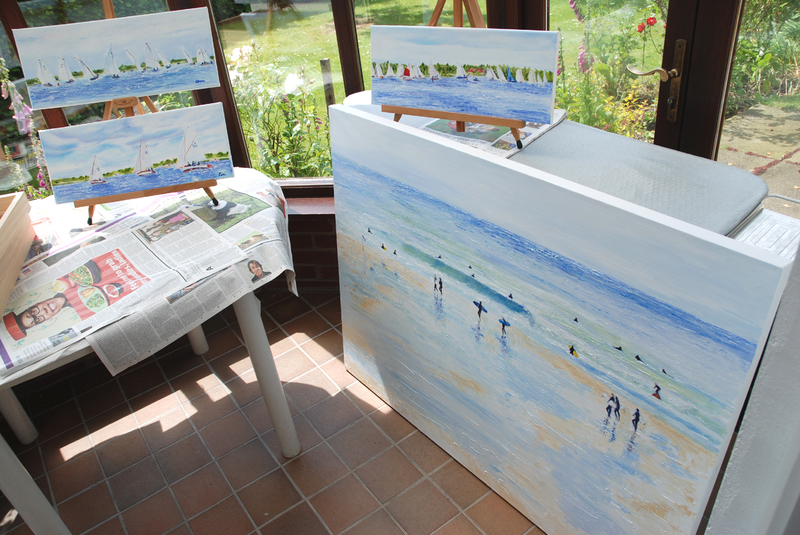 During the Norfolk Open studios I was working on some surfing paintings and a yatching regatta series, both proved popular, so it is with excitement they get their first finished viewing at the Playhouse. One sold during the open and another was commissioned. Hoorah. I sourced a really complimentary frame for the new sized canvas and width. They are 20 x 8 in. They are only 18mm deep as opposed to my usual 38mm for the larger canvas. The Playhouse exhibition runs for the month of July 2012, so if your passing take a look. Enter through the bar if the main doors are shut. Access is available daytime and evenings. There are two floors and some 30 paintings will adorn the halls. I have themed it as Autumn inspirations (ground floor) and coastal scenes (first floor). I will add a new blog post soon with a few more preview shots and information. Comment for Which paintings are in the drying room? The boat paintings are looking good!